Quiet house comfortably equipped with new equipment. This house is adjacent to the one proposed in the ad No. 1195510 These 2 locations, completely independent, are renovated in the same style and have different capabilities. Main piece with stone wall and wooden beams. Exhibition sunny morning east side yard and afternoon west side terrace and countryside. 1 cellar for storing bicycles. Garden furniture with tables and chairs Barbecue Net and badminton rackets. 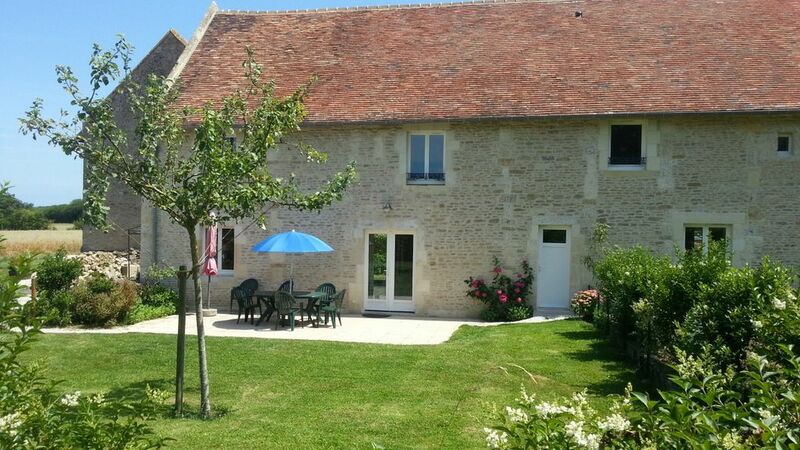 This is a beautiful and peaceful property in a great location for all the Normandy landing beaches, museums and countryside. It is extremely well equipped and comfortable. Only 5 minutes drive to the Merville Batterie and 10 mins to Pegasus Bridge. There is a boulangerie only 15 mins walk away. Plenty of coastal walks along the Orne and plenty of cycle routes if you prefer. 5 mins drive to Merville Franceplage where there is a small supermarket, shops, restaurants and a lovely beach. 40-50 mins drive to the coastal towns of Deauville, Trouville and Honfleur and the other way only 30 mins drive to Bayeux for the tapestry. The owner is very friendly and accomodating. I would highly recommend this spacious and comfortable cottage. If you are taking your own bedding there are blankets but I would suggest taking duvets and more than just sheets. Beautful stone property with everything you need to hand. Private garden, great views. A perfect location, two minutes drive from the village, a short drive from the beach. Quiet and secluded, yet an easy drive from so many sights and attractions. Lovely landlord, very accommodating and friendly. If your looking for somewhere very nice to stay,and want a bargain, then this house is for you. Very tastefully decorated and all rooms are very spacious. Sallenelles village is a 10 min walk with bakers and tobaconist.A ten min drive will take you to Merville beach, or back to the ferry where en route there is a McDonald's,Carrefour or aldi supermarket and petrol station. I would highly recommend this property,everything is available for you to use,even BBQ unit and Badminton set.Wifi worked a dream on several appliances. Fab place for a holiday!! My family and I had a marvellous holiday in this house. It has been restored to a high standard and is well kitted out for holidaymakers. The owners were lovely and very helpful. Well recommended. We will be back! Propriétaires accueillants, maison bien équipée, fonctionnelle et très propre. The farm is located 1 km from the town of Sallenelles or is the site protected from Bay Orne One can discover the House of Nature and sîte Bay with walking trails and observation posts birds. The nearest beach is located in Merville Franceville 4 km. Fishing the beachfront bar and the mouth of the Orne. A bicycle path runs along the coast between Ouistreham and Merville Franceville Sallenelles and provides access to the beach, bike, 10 minutes. Hiking trails pass near the Ferme du Buisson. An equestrian center is located 200 m from the farm. All shops in Merville Franceville 4 km. Caen: the castle of William the Conqueror of Normandy Memorial Museum. Bayeux and the famous Bayeux Tapestry. Les tarifs sont indiqués pour l'ensemble de la location et pour le nombre maximal de 9 personnes. Un supplément est demandé au dessus de 9 personnes si la capacité du gîte le permet. Un supplément chauffage de 0,14 euro par kwh est demandé pendant les périodes de octobre à avril.En haute et très haute saison, location à la semaine uniquement du samedi après midi à partir de 16 heures au samedi matin à 10 heures. La location en week end fait l'objet d'une tarification fonction du nombre de nuits et de la période de l'année.